September is such a strange month in Libraryland. It goes from the hustle and bustle of summer reading to an eerie sort of calm. Programming still goes on, the preschoolers and baby/toddler set still keep us busy, but it is just a different energy. It is a bittersweet time, to be honest. The great thing about September? NEW PROGRAMS!!! That’s right! We have new stuff kicking into gear that should bring a smile to every kiddo’s (and parent’s) face. Let me take a minute to share with you our amazing Fall lineup. From new programs, revived programs, and extended programs, we have something for all ages! Check out what we have in store! This program is not new, by any means! In fact, it is one of our most popular programs. That is way starting in September, Story Time for Littles will be offered each month! We are so happy to announce this program will now run September through November, take a break off during the month of December, then will be back from January through May. Join us each Monday morning at either our 9:30 or 10:45 session! It is a great time to share stories, songs, rhymes, art, and play with your little one. It is geared at ages birth to 36 months, but as always, siblings are welcome! If Monday mornings aren’t your thing, don’t forget we offer an evening session twice a month! Check out the details here. It’s BA-AAACK! By popular demand, we are bringing back Exploratorium Junior. This program has all the hands-on fun of our regular school-aged Exploratorium but with little bodies and brains in mind! Preschool and toddler kiddos will have the chance to explore STEAM-based experiments and activities with their grown-up while hearing some great stories to learn even more about the topic of the night! This program will be offered the fourth Monday of the month at 6 p.m. starting in September and will be replacing Family Story Time. Straw Rockets is the first topic and should be loads of fun! Come join us for these and our regular programs such as Creativity Lab, Exploratorium, Preschool Story Time, and more! We LOVE contests! Especially ones that have our patrons sharing their creative gifts with us! In the past have done various creation contests that fit whatever the summer reading theme is that year such as castles, critters, and beach bags. This year, with a water-theme for summer reading, we went with boats! Our only real rules were that the boats had to fit a base of no bigger than 12″ x 18″ and that no food items could be used to build. Otherwise, anything was fair game (and no, they didn’t have to survive a float test!). The boats that came rolling in blew us away! We have four categories up on display currently. To make it fair, the categories are preschool and kindergarten, grades 1 through 3, grades 4 through 6, and a family category which is new but hugely popular! The cool thing is that patrons who come in can vote for their favorite in EACH category. The winners will be displayed for a week before going back to their creators with a prize. Voting is going on through the 20th, so if you haven’t voted yet, stop by and cast a ballot for your favorites! The Captain Underpants books already were flying off our shelves thanks to summer reading, but with the movie out, we knew we had to celebrate so we hosted a Captain Underpants Party! We hosted a fun mix of games and crafts to keep our active superhero patrons busy. This event was an hour and a half and patrons could come and go as they pleased so having activities that were open-ended and adaptable to almost any age was the goal. From the feedback we got from our 150 guests, the things we planned achieved these goals! The best part? These are things you could easily recreate if you are having a party, whether it is for 5 guests or 150! Read on to see what we put together. As people came into the event, we had them start by finding out there Captain Underpants name using Professor Poopypants’ Name Changer. This was a downloadable from the Scholastic site. Because we wanted a more colorful sign, we just typed recreated it in Canva which worked very well. Kids quickly wrote their new name on a name tag and off they went to the next station. Since capes prove tricky in regards to expense (and sometimes liability), we opted to have a mask station where are patrons could create a mask to go with their new Captain Underpants identity! Personally, I’ve always loved when George and Harold hypnotize Mr. Krupp for the first time. The image of him on the desk pretending to be a chicken before he becomes Captain Underpants just cracks me up! That said, we knew we had to have a station with the Hypno-Ring. We created a giant hypnotic swirl on paper and attached to what is usually a ship’s wheel decor piece from our summer reading. We then thought up some super silly actions for kids to act out. We created slips for each task, cut them apart and threw them in our handy dandy cauldron. To get “hypnotized” kids had to stare into the swirl while pulling an action to act out from the cauldron. Honestly, I was worried some of the older kids would play the too-cool card and walk past this station but it turned out I was worried for nothing. We had some super silly actors of all ages at this station pretending to be a hot dog about to be eaten, an angry chicken, a cat taking a bath, and more! This station was a lot of fun and definitely easy for any age! Kids could test to see how high they could stack the toilet paper without it falling and how fast they could stack. We actually posted a volunteer at this station to time kids. She also helped with our Pin the Cape Station! We blew up and painted a large image of Captain Underpants himself for this version of Pin the Tail on the Donkey. Kids would put the blindfold on, spin three times, and then try to pin (er, tape, to be accurate) the cape to Captain Underpants’ neck. I’m sad to say I don’t have an after pictures of this station because this guy was covered in red capes! I’ll be honest, this station went best with a parent or grown-up willing to be silly! The objective? To stand behind the long red line and fling a pair of tighty whities as far as you could. From that line to the first shorter line was about 4 feet. Each red line after took you another 2 feet. A lot of kids got to see a whole new side of their grown-ups that day as they were learning to use the elastic waistband to launch the underpants! Even if they didn’t get the concept of how to fling them with the technique we were thinking of, a lot of kids were giggling as they threw giant underwear around the library. Yeah… you read that correctly! The Captain Underpants books are well-known for their toilet humor and we couldn’t help help but go there! Using a toilet seat, round trashcan, card stock, and some good ole’ duct tape, we created our own version of the Turbo Toilet 2000. We then created “turds” from scrunched up newspaper covered in wrinkled brown construction paper that was wrapped up in packaging tape so it was durable but gave a squishy feel. Kids had a chance to see if they could get 5 turds into the toilet before their turn was done. Hands-down, we got the BEST feedback about this station from parents and kids alike! We have a magnetic pillar in our department that we have done some fun stuff with in the past, but this may have been my favorite! We created a school sign like in the books and put out magnetic letters for kids to leave their own silly messages! We had tried to use smaller letters but the magnets didn’t quite cut the mustard so we ended up with large foam letters instead and the kids still had fun with them! These printables were all free on the Scholastic website. Have you ever tried Doodle Stations before? We throw them up at events periodically because they are a HUGE hit with patrons, young and old. Basically we cover table tops with white craft paper or butcher paper. We set out colored pencils and leave a note letting patrons know we want them to draw on the paper. We get some awesome art work doing this! Check out these examples! The activities you just scrolled through are located all throughout our department. It prevents congestion and chaos in a main meeting room and still encourages people to check out the collection. It also meets the needs of kiddos with special needs or families with very young children. We keep more challenging crafts or activities where materials could be messy in our Children’s Program Room. For this event, we had three activities in our program room. We had the fidget spinners craft we gave you in our sneak peek, a Captain Underpants Bookmark, and a Playdoh Poo station set up for kids to explore at this event. Even the big kids LOVED the Playdoh! And who doesn’t love a fidget spinner these days?! Throwing this together during Summer Reading was not an easy task, but it was worth it! Our community absolutely LOVED our Captain Underpants Party! Cat in the Hat is Back! 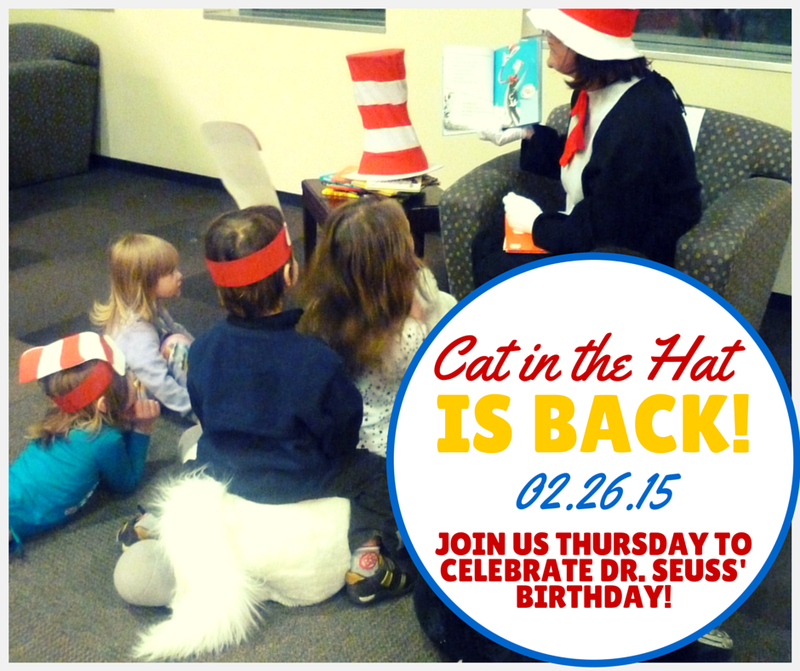 Join us on Thursday to meet the Cat in the Hat and celebrate Dr. Seuss’ birthday! We will have games, stories, crafts and more! Bring the whole family. How-To: Make a Dump Truck flannel board! Parents often ask where we get ideas for story times and programs, and we’re quick to say, “PINTEREST!” And while it is true, we also do our fair share of thinking up crafts and activities on our own or as a department. To be honest, our programs are a pretty even mixture of inspiration (from Pinterest, teacher and librarian blogs, and parenting sites) and imagination. That was definitely the case for the Dump Truck flannel board (sometimes called a felt board) that I created for this week’s Wee Wigglers!